It’s already 3rd January and we have no idea where Christmas and New Year went! Firstly, a belated Happy New Year and we both hope you had a great Christmas wherever you happened to be. Christmas this year, for us, was a relatively quiet and low-key affair. Continuing the tradition set by the Watson Family, we planned a picnic on Christmas Day. Whereas the Watson Family picnics took place in Scotland regardless of the weather, and the risks were fairly high, here, the odds against arctic gales and driving horizontal rains are slightly more favourable, and sure enough the forecast for Christmas Day was fair to middling. December, generally, was bitterly cold here in Granada Province. On a couple of mornings, I got into the car to go to work to find a hard frost on the windscreen, and found myself asking if we had an ice scraper! We can’t recall such hard frosts in the village last year, even though it was relentlessly cold. Despite the low temperatures, we had hardly any rain, so the start of the ski season in the Sierra Nevada did not look as promising as it did last year. Even now, we have only had one or two significant falls of snow in the high Sierra Nevada; the lower cross-country resort at Puerta de la Ragua is still snow-free. Last Year, for our Christmas Day picnic, we took a hike up into the mountains above Nigüelas, optimistically believing we might make it to the snow line (fat chance!). 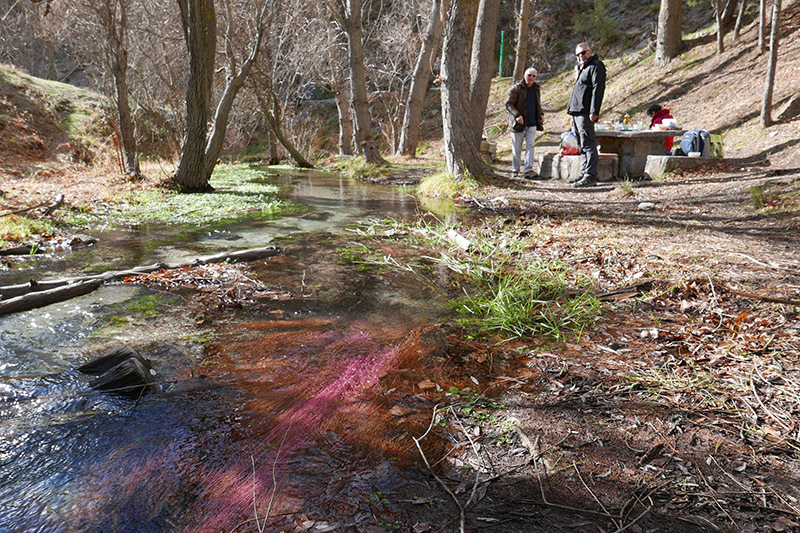 This year, we paired up with friends David and Lorna from the neighbouring village of Albuñuelas and drove into the Sierra de Huetor to find a picnic spot that David and Lorna had stumbled across a few years back. The Sierra de Huetor remains one of our favourite areas in the immediate Granada vicinity, particularly on the south side of the range where you can walk through stunning pine forests and catch vast views of the Sierra Nevada facing you. Sure enough, the picnic spot was delightful, even though the weather was on the verge of changing its mind from blue skies and sun to something less promising. David is an excellent cook, and he had brought everything but the kitchen sink - garlic soup was heated on a camping stove, rolled and stuffed chicken breast was presented alongside all sorts of other treats. We had volunteered to produce salads and a few snacky things, and we baked up some mini quiches and sausage rolls (to our own, very satisfactory recipe! ), so just about managed to save culinary face. When the clouds did eventually roll in, our sylvan spot became decidedly chilly, despite its abundant charm. We were sitting around a table, a crystal-clear brook gurgling past, and we were little disturbed, apart from a spate of Spanish families popping up the same route for a quick Christmas breath of fresh air. By the time we had consumed desert (syllabub and fresh forest fruits! ), we were the only people left in the woods, and it was still and silent. When your tummy is full, and you have had a seasonally appropriate amount of wine and cava, and the weather is beginning to close in, it can be quite difficult to meet the prospect of a post-luncheon hike with any degree of enthusiasm. We are very keen walkers, but the prospect of a blazing fire at home, was marginally more tempting. However, we bundled the picnic gear back in the car and stepped out, determined to get some exercise. Despite the weather, which was by now wet, it was still a great walk. In any weather, the mountain scenery in Andalusia remains breathtaking, and there were breaks in the rain, sufficient for us to look in awe at the freshly covered peaks of the Sierra Nevada. Shafts of grey-yellow sunlight would burst through sullen clouds to blast the startling white snow, as further shrouds of leaden cloud wrapped, furled and unfurled in and around the valleys and crags. Dramatic and mystical and beautiful. Our own Christmas roast dinner had been taken the night before, on Christmas Eve, as we had bought a large rib of beef from the market in Granada and decided to cook it on 24th, and then have it cold when we returned from our Christmas Day picnic. Andrew and I are both lovers of the cold leftovers associated with Christmas - cold meats, pickles, cheeses - and when we finally did get back from our expedition, damp and chilly, it was bliss to get the fire lit and hunker down with comfort foods. The beef was delicious, as were the leftovers from the picnic. We had opened our stocking presents in the morning (yes, we still have stockings! Who doesn’t!? Father Christmas still comes to our house.) and saved the main presents for the evening, when we’d be on our own. We managed to sneak in a quick FaceTime chat with the children, although the timing could have been better - they had eaten their Christmas lunch and consumed a certain amount of alcohol, so looked as though they would have preferred a post-prandial snooze rather than a jolly festive chat with us two. I have missed seeing them hugely this year, but will get to see them soon enough when we nip back to the UK. Christmas came upon us quite quickly. This year, I was working in Granada until 21st December, and the weeks over October and November had presented a fair few work-related challenges that we managed, over time, to resolve. Last year, we were able to soak up much more of the pre-Christmas atmosphere, with a trip to Cordoba and more opportunities to wander around the illuminated streets of Granada, but this year was taken up with real life, as we settle into our stride here. Of course, we now also have a new project to concentrate on - our new house - all still slightly surreal, as we are still very much living in Casa Magdalena, so the new house feels like something rather fictional, and will do until we manage to get the builders in over the next month or so. A new chapter, a new year and much more excitement to come!